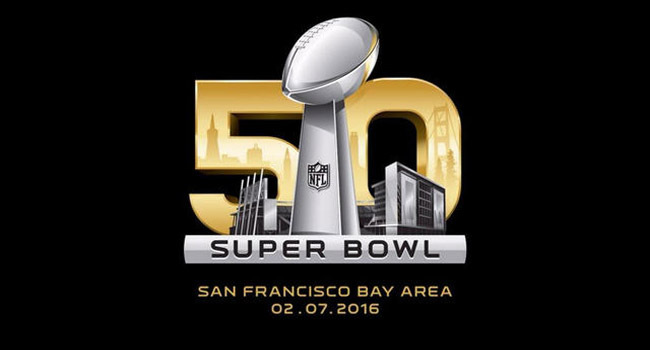 Super Bowl 50 Odds are out and there are few surprises among the favorites. You’ll notice immediately I used the term ’50’ instead f the Roman numeral ‘L.’ This is because the National Football League recognized the potential issues by having their marquee game represented with a big ‘L.’ This often stands for “loser” or well…. You get the picture. Anyway with the season officially over, here are your odds for next season already. Seattle Seahawks 5/1 – Can they overcome perhaps the toughest loss in Super Bowl history? 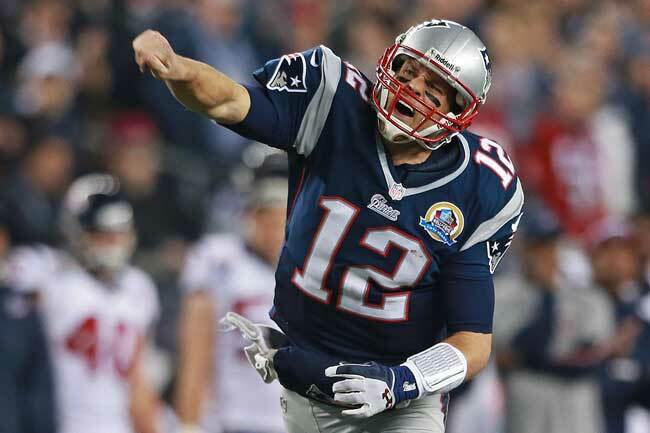 New England Patriots 7/1 – As usual, this team will look different in several areas as they attempt to repeat. Green Bay Packers 8/1 – Another team struggling to get past a horrible loss. At least it wasn’t in the Super Bowl. 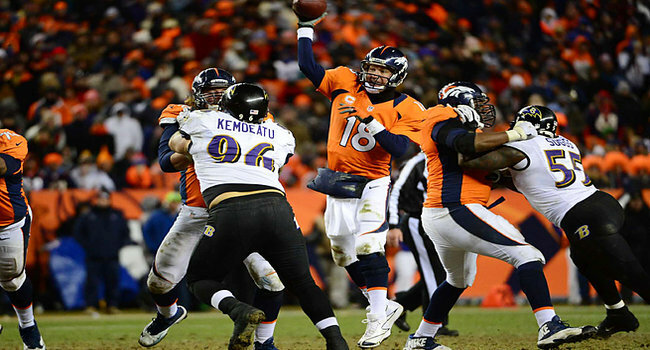 Denver Broncos 10/1 – Keep an eye on this, if Manning doesn’t return, the odds will drop considerably. Dallas Cowboys 14/1 – Can they repeat the success of this past year and what about Dez Bryant’s contract? Indianapolis Colts 14/1 – Must solidify the running game and the running defense to build around Andrew Luck. 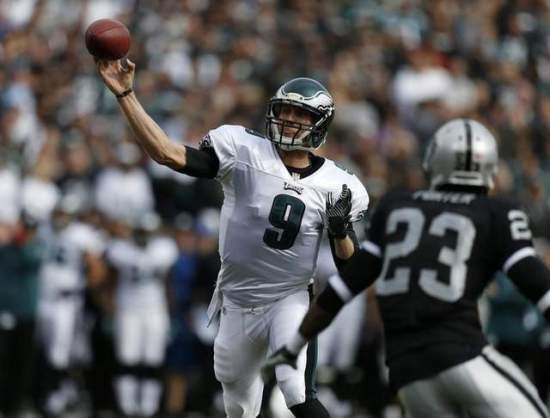 Philadelphia Eagles 20/1 – Late season swoon should be forgotten as Nick Foles returns under center. Colin Kaepernick must avoid these situations in 2015 and under a new coaching staff how easy will it be? San Francisco 49ers 20/1 – With Harbaugh gone, can Jim Tomsula get Colin Kaepernick back on track and can the defense get younger? New Orleans Saints 22/1 – Rob Ryan returns despite a brutal defense in 2014 but the offense needs some work too behind an aging Drew Brees. Pittsburgh Steelers 25/1 – Offense was prolific, but defense needs serious upgrades. Ben Roethlisberger contract situation a top priority too. Arizona Cardinals 33/1 – Imagine what this team could do with consistent QB play? Larry Fitzgerald contract also an issue. Baltimore Ravens 33/1 – Ravens blew 14-point lead to eventual champion Pats; pieces are there but depth needed. Detroit Lions 33/1 – Big step for the entire organization in 2014, but Matthew Stafford must play better on a consistent basis. Atlanta Falcons 40/1 – Team has addressed defensive liabilities by bringing in Dan Quinn; now the talent must get better. Carolina Panthers 40/1 – Under .500 division title likely saved Ron Rivera’s job but team must improve in 2015. Chicago Bears 40/1 – John Fox will bring in some stability but can he do anything to make Jay Cutler better? Cincinnati Bengals 40/1 – Andy Dalton is now in a must-win situation. Getting to the playoffs is nice, but 0-4 is unacceptable. Houston Texans 40/1 – Who is the QB entering the season and can J.J. Watt get some help on the defensive end? Kansas City Chiefs 40/1 – Chiefs must get more out of wide receivers and keeping Justin Houston on D a priority. Miami Dolphins 40/1 – Somewhat surprisingly, Joe Philbin is back but he’ll need to find more consistency from his entire team. Minnesota Vikings 40/1 – There’s a lot to like in Minnesota but still many pieces to be put in place by Mike Zimmer. New York Giants 40/1 – I’m a little surprised to see Tom Coughlin back and his fate will rest on Eli Manning’s shoulders. San Diego Chargers 40/1 – When is the last time Philip Rivers won a huge game? Chargers’ fans would like to know. St. Louis Rams 40/1 – If this team gets consistently good QB play are they a team to watch in 2015? Buffalo Bills 66/1 – Kind of an odd hire in Rex Ryan. Defense wasn’t the problem in Western New York. Cleveland Browns 66/1 – One QB (Hoyer) is a free agent and wasn’t great. The other QB (Manziel) is now in rehab. New York Jets 100/1 – Will Todd Bowles stick with Geno Smith or does he have another agenda? Tampa Bay Buccaneers 100/1 – Mariota or Winston? There are risks and rewards for each. Tennessee Titans 100/1 – If they decide to go QB, they’ll likely be stuck with whoever is left over after Tampa selects. Washington Redskins 100/1 – My gut tells me Jay Gruden would love to move on from RGIII but he won’t. Can he stay healthy is the question. Jacksonville Jaguars 200/1 – Don’t be a bit surprised if this team is greatly improved. Skill players needed but there is a decent nucleus. Oakland Raiders 200/1 – I’m not overly impressed with the Jack Del Rio hire. Someone to groom Derek Carr would have been better. 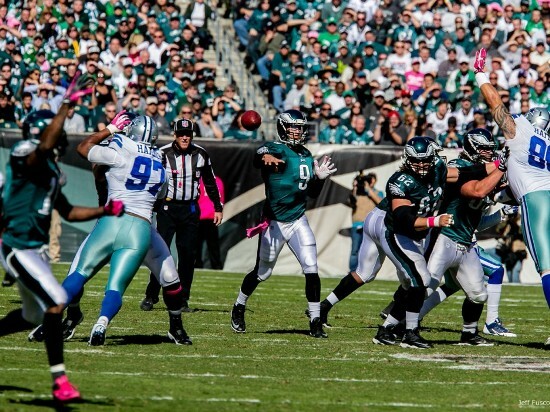 Has the glitter disappeared from Chip Kelly's offense which has lost three straight? It wasn’t that long ago that Mark Sanchez was the darling of Philadelphia and right alongside of him was his head coach Chip Kelly. Now, both might as well be the red-headed step-sisters at the nearest Philly orphanage. The Eagles went into Washington last night and lost on a Kai Forbath field goal with five seconds left by the final of 27-24. The loss sends the Detroit Lions into the playoffs and now means the only way that Philly can get in is as a division champion. They will need the Cowboys to lose to the Colts today, then to the Redskins next week and they have to beat the Giants in their finale. In other words, things aren’t so good. Chip Kelly’s no-huddle system is the greatest offense in the history of football when the team is doing well but he is now about to be run out of town after three-straight losses. On his coat tails will be Sanchez whose numbers don’t look too bad (37/50 374 yards 2TD/1INT) but he had a costly fumbled and his interception came at a horrible time and led to winning field goal. To be fair, Sanchez as far from the only problem. Cody Parkey was one of three in field goals, the Eagles had 13 penalties and also dropped four passes. The imperfect storm happened at the worst possible time for the Eagles. If you’re in Philly today, you are a Colts’ fan for sure. Mike McCoy's Chargers rallied to stun the Niners and kept their playoff hopes alive. On the left coast last night in the late game, San Diego rallied from a 21-point deficit to defeat San Francisco 38-35 in overtime. The victory keeps the Chargers playoff hopes alive as they move to 9-6 on the season. Denver has already won the AFC West so the best the Bolts can do is a wild-card but it’s a logjam in the AFC to say the least. Division rival Kansas City is in Pittsburgh today. The Chiefs are 8-6 and are looking to keep their playoff chances alive as well with a win over the 9-5 Steelers who can clinch a playoff spot with a victory. Also at 9-5 is Baltimore and then Buffalo is 8-6. 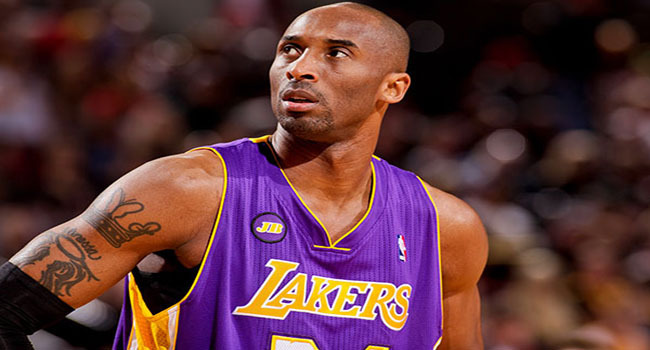 NFL Commissioner Roger Goodell made it clear yesterday that there will not be an NFL franchise in Los Angeles in 2015. Goodell told St. Louis, San Diego and Oakland that any relocation would not happen until at least the 2016 season. That doesn’t mean the Rams, Chargers and Raiders can’t file for relocation on or after January 1st though. The problem is that a “super majority” is needed and Goodell made it pretty straight-forward comments that this won’t happen for 2015. The question in my mind is why is the league so adamant about having a team in the LA area? It’s a bit of a rhetorical question because LA is the second biggest TV market in the country but is there really a fan-based demand for a team? I’m not saying there isn’t because I don’t live in SoCal but from everyone I talk to and listen to I get the distinct feeling a team in LA would be a rather “ho-hum” type of move. Of those three teams I would think the Rams have the greatest chance of heading to Los Angeles and I say that because their owner seems dead-set on it. The Raiders are flirting with San Antonio which appears hungry for NFL football and I believe the Chargers will eventually get a new stadium. Each year there is a team that seems to jump off the paper and catch the attention of the media and fans. It is subject to hype that reaches another level. This season that team is the Philadelphia Eagles. Last season, the Eagles were 10-7 SU, 8-8-1 ATS and 9-8 on the Over/Under. Some football analysts have gone as far as saying a Super Bowl win is a possibility in Philly. Anything is possible but that is not probable at least this season. The Eagles certainly have a good opportunity to win the NFC East, but even winning the NFC Championship looks too far out of their reach this year. Last season it seemed that the Eagles received some unexpected breaks. Amongst them, the collapse of both the New York Giants and Washington Redskins, two bitter division rivals. The Eagles also lucked out in games when they faced a number of backup quarterbacks namely the Green Bay Packers minus Aaron Rodgers and the Dallas Cowboys without Tony Romo, which was in the final game of the season and determined the winner of the NFC East. Detroit was also whipping the Eagles when a blizzard hit and the Lions forgot to put on snow tires and the Eagles rallied to win. The Eagles also defeated Tampa Bay during a stretch when the Bucs were winless early in the season. It seems many breaks went Philly’s way last season and those things do not always happen that way. After all that drama in the regular season was behind them, the Eagles hosted a playoff game and lost to the New Orleans Saints. They should not be ashamed of the loss, but it showed they still have things that need improvement before they are an elite NFL team. Nevertheless, the progressive offense of head coach Chip Kelly made for lots of headlines. Nick Foles won accolades that were deserved with a season that included throwing 27 touchdown passes while being picked off just twice. The Eagles offense also was the NFL leaders in rushing. However, the defense was less than stellar ranking a dismal No. 29 out of 32. Only 37 quarterback sacks last season for the Eagles defense and it does not look as if they are any stronger this season. The Eagles released their best wide receiver shortly after the season was over. DeSean Jackson caught 93 passes for over 1,300 yards and 9 touchdowns. He will be hard to replace, but the offense of Kelly relies on execution and teamwork and they will find a replacement for Jackson even if it is by committee. According to Bovada and betonline, the Eagles are co-favorites to win the NFC East. Online sportsbooks topbet and sportsbook.com have the Eagles at 28 to 1 to win the Super Bowl. LeSean McCoy and the Eagles should win the NFC East behind a dynamic offense. Today begins my journey through the six divisions of the National Football League as I look at the odds for each and give you my winner. First up, the NFC East. 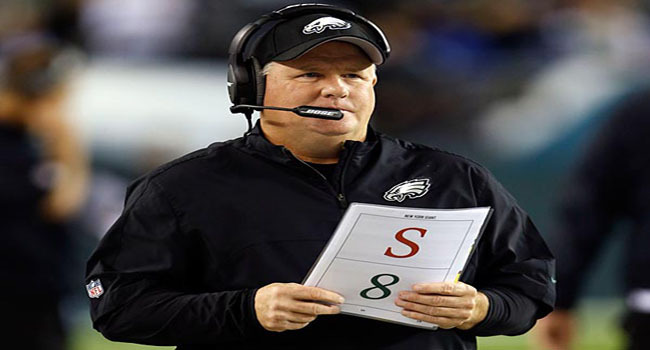 Philadelphia Eagles +125 – The Eagles made the playoffs in Head Coach Chip Kelly’s first season and it wasn’t behind Michael Vick who is now with the Jets. It was behind Nick Foles who played tremendously and got the Eagles a home playoff game where they were beaten by the New Orleans Saints. Gone from the team is DeSean Jackson who is now with the rival Redskins. To make up for his numbers the Eagles brought in Darren Sproles who should provide an amazing compliment to LeSean McCoy. 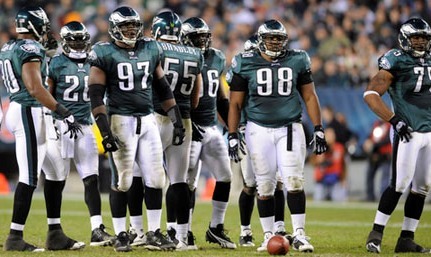 If the defense improves, the Eagles could be viable contenders in the NFC. The schedule features the AFC South and NFC West so it’s the extremes in that case. New York Giants +300 – The Giants have missed the playoffs the last two seasons and I for one thought Tom Coughlin would be out of a job after they started 0-6 last season. Coughlin is back but things are different on the offensive side of the ball where more of a West Coast offense is installed. It’s really pretty simple for there; Eli Manning has to take care of the football a lot better than he has in recent years. Jason Pierre-Paul looked good in the team’s first two preseason games and that’s good because they need him to anchor the defensive line. The secondary is upgraded and should be better as well. The G-Men get Indianapolis, San Francisco and Arizona at home but do have to go to Seattle. If the running game is clicking then good things are on the horizon. Can RGIII handle the transition to Jay Gruden's new offense? Washington Redskins +375 – The ‘Skins welcome new head coach Jay Gruden whose number one job is keeping Robert Griffin III healthy. We shouldn’t see nearly as much read-option if any at all which means RGIII is going to be more of a pocket passer. What will help that transition is Alfred Morris running the ball well again. DeSean Jackson should help balance the offense as well. Defensively, there is plenty of talent on that side of the ball but it can’t be utilized unless the front seven can get to the quarterback. Trent Murphy, defensive end from Stanford should help in that department. The second half of the schedule is brutal with trips to Indianapolis, San Francisco and the Giants but they do finish with Dallas and Philly at home. Dallas Cowboys +400 – If I had looked at the Cowboys back in the spring I might have said this team had a chance to compete in the NFC East but then Sean Lee was lost for the season and then Orlando Scandrick was suspended for four games. Toss in a few other injuries and you’ve got a defense that could rival last year’s in terms of ineptness. Offensively, the Cowboys will ride only as far as Tony Romo can take them and I think his health is a serious question mark. Jason Garrett knows they have to run the ball to keep Romo healthy and his defense off the field. The question is, will he be able to do that? It’ll be tough with all the ‘toys’ that Romo has to play with but if he wants to win, he’ll have to. Dallas has a favorable schedule with only a trip to Seattle being the toughest out of division road trip. Overall Thoughts: I don’t know how you can go in any other direction here other than the Eagles. I can see a scenario where the Giants start pounding opponents with their running game but I don’t think it’ll be enough. The NFC East has been a very mediocre division the past couple of seasons, but this season looks to be much more competitive. The race for first place in the NFC East will be a close one as three of the four teams are bunched together and one, the Philadelphia Eagles being the clear favorite. Odds makers are Bovada and topbet have Philadelphia at 7 to 5, the New York Giants are 5 to 2, and both the Dallas Cowboys and Washington Redskins at 7 to 2. Most bookmakers say the division is the Eagles to win, but the team has a difficult regular season schedule. The Cowboys did not do anything to help themselves over the offseason and will have for the second straight season one of the worst defenses in the league as Sean Lee will miss the entire year. The Giants have an aging defense, but Eli Manning should play better than last season. However, New York will be lucky to finish higher than .500. Washington could be a surprise and come out strong to start the season. They have a new head coach and their talented all-purpose quarterback Robert Griffin Jr. should be completely healthy for his third season. All four teams from the NFC East are somewhat long shots for the Super Bowl, according to data taken from sportsbook.com and betonline. Philadelphia is currently at 26 to 1 on most sites, with the Giants at 27 to 1, Dallas on 40 to 1 and Washington at 47 to 1. Dallas has a season wins total of 8, with the UNDER sitting at -185. The Cowboys record last season was 8-8 SU and 9-7 ATS. The Cowboys covered more games than any other NFC East club did. However, they did not cover in six of the last eight games. Rod Marinelli is the new defensive coordinator, which should help, but he cannot work miracles. The defense was last in the NFL last season giving up 415 yards a game. The New York Giants win total for this season is 8, with the OVER sitting on -110. New York was 7-9 SU and ATS last season. The offensive line should be better this season, which could help Manning, who had 27 picks last season. This will be the divisions most improved team and they should start better than last season’s 0-6. The Eagles win total is 9 with the OVER sitting on -130. Last season, the Eagles were 10-6 SU and 8-7-1 ATS. The high-octane offense of Chip Kelly surprised odds makers taking the OVER in five of the first six regular season games. However, 7 of the final 11 games were UNDER. The team should start better than 1-3 and 3-5 of last season having a full year under Kelly’s program. The Eagles are the clear favorite, should end with as many as 11 wins and could challenge the powers in the NFC in the postseason. The Redskins season win total is 7.5 with the OVER sitting on -120. Last season the Redskins were 3-13 SU and 5-11 ATS. The Redskins should be stronger this season with a healthy Griffin and should not suffer through a slide of eight games like last season. The Philadelphia Eagles visit the Minnesota Vikings in a Week 15 NFL matchup. The Eagles are laying a price that looks inflated as a road favorite, while the quarterback carousal continues for Minnesota. Philadelphia is now one game in front in the NFC East. The Eagles will look to cover for the fifth time in their last six games when they take on a Vikings team depleted due to injury. Adrian Peterson the league’s reining MVP hurt a foot during last week’s game but is undertaking an aggressive rehab and says he will play. However, if he cannot then all of the pressure falls on the shoulders of Matt Cassel at quarterback. Cassel has been given the nod even though normal starter Christian Ponder is fully recovered from a concussion. Of late, Minnesota has played well winning 2 losing 2 and tying 1 over their past five games, following a start of 1-7. The Vikings have also covered five of their past six games. Minnesota is 2-0 SU over their last two games at home. The Eagles are favored on the road by 4.5 points, with the point total sitting on 51.5. On some sites such as Bovada, the spread has been as high as 5.5. However, action on both sides on topbet and betonline has seen the spread bounce back and forth during the week, with 4.5 seeming to be the most common spot. The Eagles are 4-0 ATS over their past four games on the road and 4-1 ATS versus teams with losing records. The Vikings are 5-1 ATS over their past six games. Minnesota is 6-0 ATS over its past six games played in December. The OVER in the past seven games on the road for Philly is 6-1 and is that same number in the last 7 home games for Minnesota. The UNDER for Philly is 5-2 over its past seven games played. The teams have not played since 2010 when Minnesota won 24-14 at Philly as underdogs by 14 points. 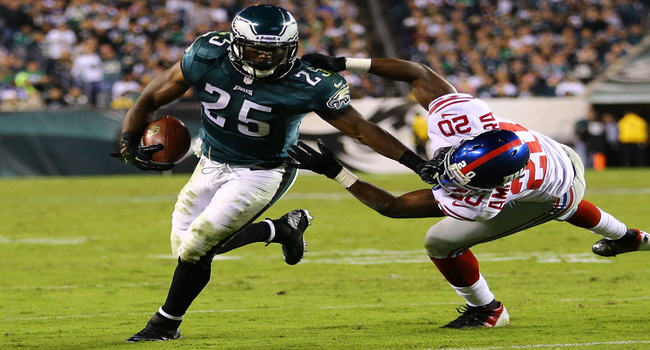 The Eagles will use their strong running game led by LeSean McCoy who ran for 217 yards against Detroit last week. 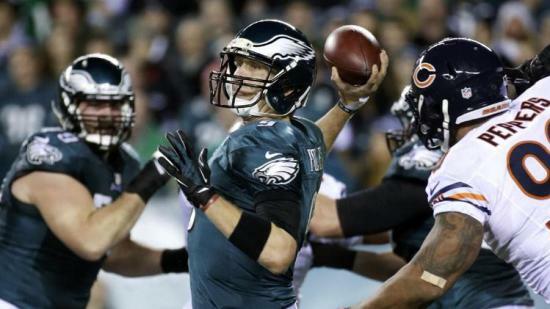 Nick Foles the Eagles quarterback will be facing the league’s No. 30 ranked pass defense and could enjoy a big day. 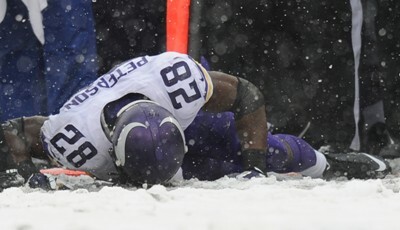 Coaches on Minnesota do not feel Peterson will play, but he has surprised them before and not until game time would that be determined. Checking online on sportsbook.com or another site as the game approaches is the best way to determine if Peterson plays, which could have an effect on the point spread prior to the game starting. Cassel has started four games this season for Minnesota and has 240 yards or more in each start. Some betting experts believe this line to be inflated and an overreaction by the market. However, due to Philly’s current great play, the spread has been places so high. However, playing at Minnesota that number looks too big. Pick: Take Minnesota and the points. Peyton Manning's Broncos are one of the favorites this year and hold a very distinct trend by themselves. The National Football League is now well underway with it’s’ preseason schedule heading for week three. As the injuries mount and the teams come together, you are in a position where you’re ready to lay money on the team you like to win the Super Bowl. Don’t just look at the odds which of course are important but there are other things to keep in mind moving forward. If you’re into trends or believe ever so lightly in superstitions then I’ve got some things that you need to see before you slap the cash down on your Super Bowl favorite. 1. Preseason records don’t mean a whole lot with one exception. If the team you are considering is currently 0-2 in the preseason, hold your money. I say this because only one time in the Super Bowl era has a team gone winless in the preseason and gone on to win the Super Bowl. That was the 1982 Washington Redskins. Furthermore, only two other teams have had winless preseason’s and made the Super Bowl and those were the 2000 New York Giants and the 1990 Buffalo Bills. 2. Check out the Eagles’ home opener. The last four Super Bowl champions, Baltimore, New York, Green Bay and New Orleans, were all the home-opening opponents for the Philadelphia Eagles. I think that trend dies this year at least on paper because all four of those teams were legitimate Super Bowl contenders entering their respective seasons. Do the New England Patriots hold a key Super Bowl trend? This year, the Eagles open on the road in Washington before returning to Philly for the home opener against……… The San Diego Chargers. Of the four previous teams and this year’s opponent, the Chargers are by far the one you’d have picked last to go to the Super Bowl so this is a trend to be very careful of entering the season. 3. Check the Patriots’ Schedule. The last eight Super Bowl champions have played the New England Patriots in the regular season. None of those were from the AFC East either meaning the trend doesn’t apply to the Dolphins, Bills or Jets. At least not yet anyway. This season, the Pats have the NFC South, the AFC North and then Denver and Houston. 4. Speaking of the Patriots… And NFC East. The past seven Super Bowl Champions have played both the New England Patriots and have had the NFC East on their schedule. This applies to only one team in 2013 and it’s a big time favorite too. The Denver Broncos will play at Dallas and at New York and will have Philadelphia and Washington at home. Their game with the Patriots is New England on November 24th. 5. 11 is a very important number. This is a stat you really can’t do much with because it depends on how the season progresses, but it does provide an important indicator of Super Bowl success. 39 of the 47 Super Bowl champs have had at least 11 or more wins. This trend has taken a beating in recent years though. Last season, the Ravens had 10 regular season wins and the year before the New York Giants finished 9-7. The Green Bay Packers finished their Super Bowl winning season at 10-6 so that’s three straight years this trend has failed. Be very careful with this trend because of the fact that Super Bowl winning teams over the last eight or so years have typically been teams who have gotten hot late in the season. You have to decide whether or not the team you think will win the Super Bowl will get to that 11-win total. Nonetheless it’s a trend to pay attention to when making your final decision. Tom Brady and the New England Patriots have regained the top spot on the NFL Futures list. New England’s 42-14 drubbing of Houston on Monday night has seen the side take a solitary lead in the NFL Futures. Tied with the Texans at 9/2 to win Super Bowl XLVII before the contest, the Patriots are now considered 3/1 favorites to lift the Vince Lombardi trophy on Feb. 3, 2013. The move sees Bill Belichick’s side become lone favorites to win the Super Bowl for the first time since heading into Week 3. At 11/2, the Patriots were preseason favorites. New England (10-3, 5-1 home) will be able to build on those odds this weekend as San Francisco (9-3-1, 4-2 road) makes the trip to Foxboro, Mass. A victory over a second consecutive top-level opponent will almost surely see those Futures odds shorten even more. The Patriots opened as three-point favorites to win the Sunday Night Football clash. Meanwhile, Houston’s loss means that for the first time since leapfrogging the Patriots ahead of Week 3, the Texans do not have at least a share of the Futures lead. A 5-0 start to the season and 11-1 record after 12 games translated to Houston being the perennial frontrunner this season. Odds of Houston winning the Super Bowl have now fallen to 6/1. Gary Kubiak’s side finds itself tied with both Denver and San Francisco for second place on the NFL Futures list. All three sides saw their odds drop after last week’s action. For Denver and San Francisco – two sides that came out of Week 14 with a win – this was more a result of the performance the Patriots put on than their own shortcomings. For Houston, it was a combination of the Patriots’ dominance and the team’s own deficiencies. Houston (11-2, 5-1 home) faces a tough divisional challenge this weekend as the upstart Indianapolis Colts (9-4, 3-3 road) visit Space City. The surprising Colts have made steady progress on the NFL Futures. The team’s Super Bowl XLVII odds fell from 75/1 in the preseason to 50/1 last week. Last Sunday’s win over Tennessee saw another 10 points lifted from those odds; the Colts are now 40/1 to win the Big Game. A win for the Colts will not only put them one step closer to thwarting what looked like a guaranteed division title for the Texans, but it will also see the side rise on the NFL Futures again. Like Indianapolis, Seattle and Washington have both seen their stock rise as we get that little bit closer to the end of the regular season. The Seahawks enter Week 15 with 20/1 odds of winning Super Bowl VXLVII. That marker represents an improvement on last week’s 33/1 and the preseason’s 45/1. The Redskins are just behind with 35/1 odds entering play this weekend. That’s an improvement on last week’s 40/1 odds and the preseason’s 65/1. Seattle (8-5, 2-5 road) heads to Toronto this Sunday to play Buffalo (5-8, 3-3 home), while Washington (7-6, 3-3 road) travels to Cleveland (5-8, 4-3 home). Both sides have division titles and the postseason on their mind. At the other end of the NFL Futures, seven more sides were pulled off the board, joining Kansas City and Jacksonville. Infamously, one of those sides was Philadelphia. Despite a win over Tampa Bay snapping an eight game losing streak, the Eagles (4-10) found themselves out of the playoff hunt and off the board. Remarkably, Andy Reid’s side had been fourth favorite (at 11/1) in the preseason to win the Super Bowl. A loss to Cincinnati on last night’s edition of Thursday Night Football only adds to what has been a truly horrible season. Also being ripped off the board were New Orleans (5-8) and Detroit (4-9). Both sides had relatively short Super Bowl odds at the beginning of the season – 18/1 and 25/1 respectively – and like the Eagles, will be looking to end a miserable season.